The Maxi-Cosi foldable carrycot transforms your Maxi-Cosi pushchair into a deluxe pram for the ultimate luxury travel for your newborn. It ensures your baby lies in the flat position, for optimum healthy development. 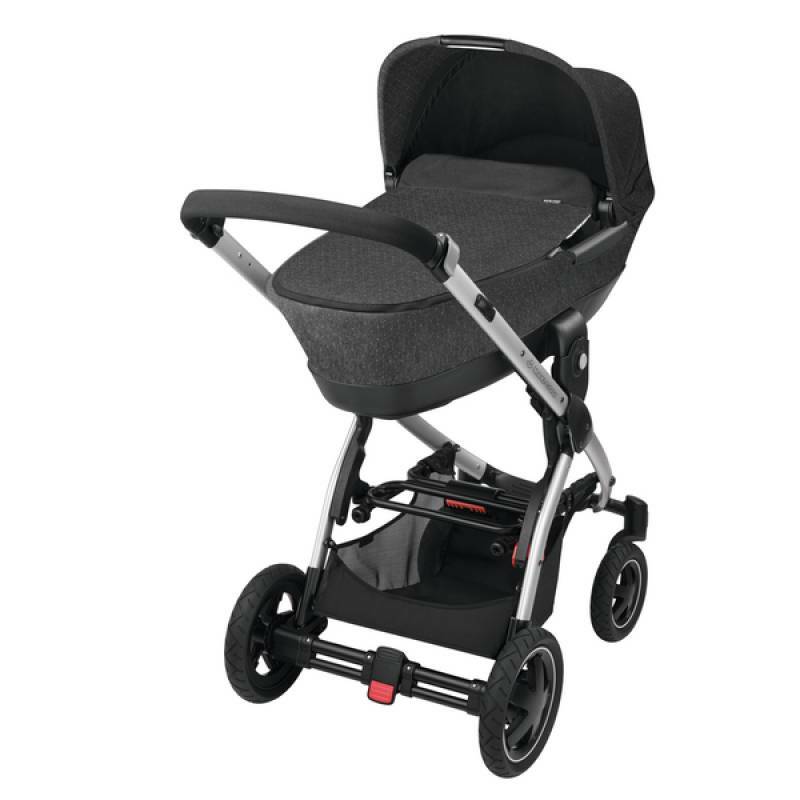 It creates a stand-out modern pram that is sure to turn heads as you walk down the street. Your baby travels facing you, in a high up position for reassuring eye contact. And because it forms a comfy, enclosed environment, your baby can relax feeling safe and secure. Designed for enjoyable trips out with your baby from birth, it can be used up to 9kg (six months). 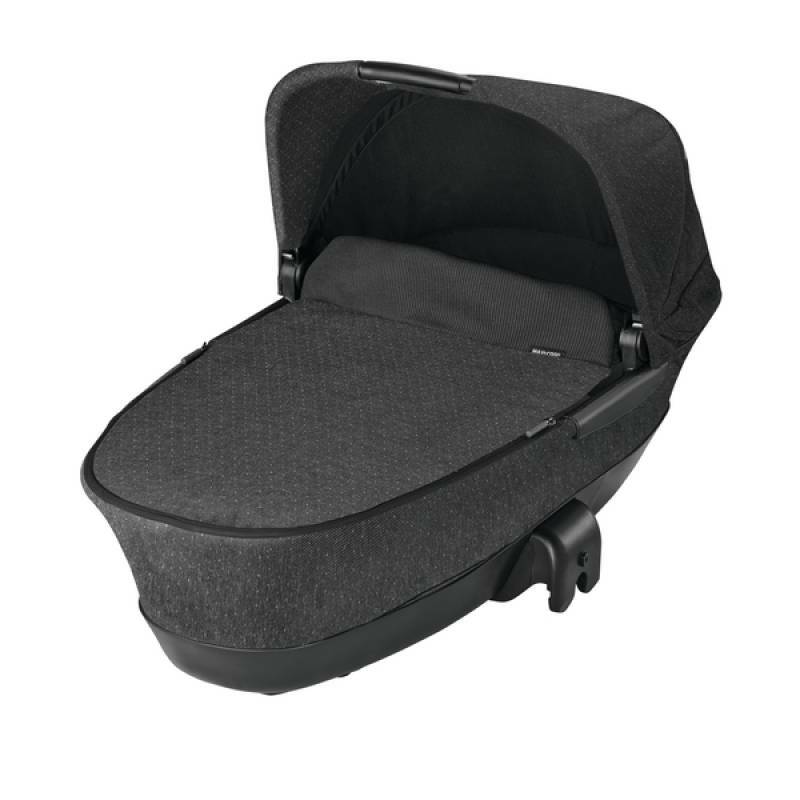 Our Maxi-Cosi carrycot has a comfy padded mattress that makes it ideal for relaxing naps on the go. The design of the carrycot with high sides and an extending hood naturally protects your baby from the weather. There’s also a rain cover and a mosquito net included to further shield your baby from rain, wind and insects. Adapters built into the Maxi-Cosi carrycot directly attach it to your Maxi-Cosi Elea or Maxi-Cosi Loola pushchairs for your convenience. You can also use it with our Maxi-Cosi Stella and Maxi-Cosi Mura Plus pushchairs using adapters supplied with your pushchair. It simply and securely clips into place and can be removed again with one hand thanks to memory buttons. It has a handle built into the hood to lift and move it easily without waking your baby. Then when you don’t need it, or it’s time to put in the car, it quickly folds flat for easy storage. Not recommended for children who can sit up unaided, roll over, or push themselves up on hands and knees.